The Woodberry Wetlands nature reserve on Stoke Newington’s east reservoir is startlingly beautiful for something in inner London. Wild flowers roam rampant across the banks and birds and butterflies shelter in towering reedbeds. So beautiful, in fact, that to take in the surroundings most would happily tolerate a café offering only greasy fried eggs and watery coffee. Thankfully you needn’t do so at Lizzy’s at the Coal House, the café in the converted former 19th century coal store. For the healthy there’s bircher muesli or eggs any way you like them. For the indulgent, choices include grilled pancetta, or truffle mushrooms with chevre. There are a few less common options too, such as hot smoked mackerel or homemade salt beef. It is a sweltering July day when we take a seat on the lawn outside. The weather doesn’t scream soup, but the chilled and creamy lentil, pistachio and mint soup was quite refreshing and plenty filling. 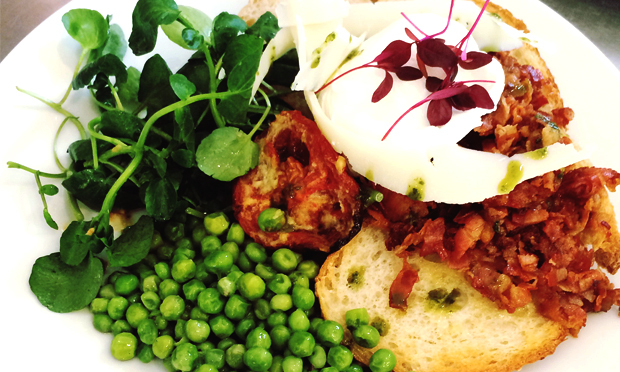 For mains I (the indulgent one) pick the grilled crispy pancetta, with garlic peas, parmesan, and poached egg, topped with basil oil. With such fine ingredients it is a cut above your regular cooked breakfast and costs only £8. And it arrives piping hot, unlike at some breakfast joints where the food seems to have been kept lukewarm. The added truffle field mushrooms are well worth the additional £1. My companion (the healthy one) opts for a middle eastern style quinoa and cauliflower salad, laced with cumin and raisins. The light, fresh flavours nicely cut through the earthy tones of the accompanying smokey aubergine paste. The dish was served beautifully, though it was a touch on the small side. A local flavour runs through the menu, with much of the food sourced from London businesses. Most of the bread – nutty flavoured seed-packed rye or crispy sourdough – and delicious cakes – think date and cashew or chocolate and Guinness – are baked by the local Spence bakery. The ice cream is from a North London gelateria – we recommend the salted caramel or pistachio. To my surprise few of my friends in Hackney even knew the reservoir existed. So I am somewhat loathe to sing the praises of Lizzy’s café too loudly, or the beautiful surrounding nature reserve, in case I might no longer be able to find a free table. But the food is so delicious, such good value and the café is in such a peaceful setting, this eventuality is surely inevitable. 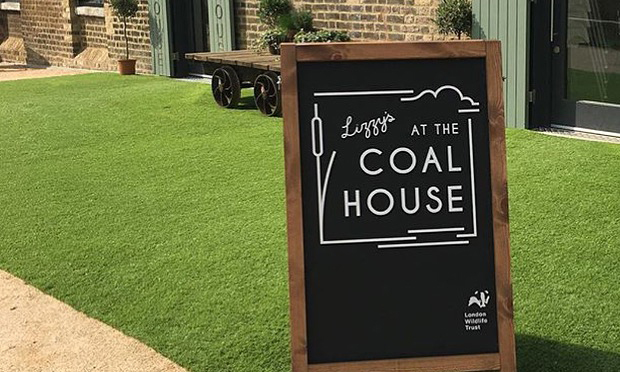 Lizzy’s at the Coal House is open 9-4 daily and the kitchen closes at 3:30pm.